Independent Set and Vertex Covering in a Proper Monograph Determined through a Signature. Australasian Journal of Combinatorics, 59 (1): 64-71, June 2014. An autograph is a labeled graph that uses numbers as labels for its vertices. The collection of these numbers is called signature. An autograph uses absolute difference of numbers, corresponding to the vertices, to describe adjacency among its vertices. An autograph can be classified according to the nature of its signature. If an autograph has a signature consisting of distinct positive numbers, it is called proper monograph. The concept of autograph was introduced in 1979. Since then, a lot of studies had been made about it. However, most of these studies are focused on determining which graphs are autographs. Only a handful of works had taken advantage of the fact that autographs are well represented by their signatures. In our study, we used the signatures to observe some properties of the corresponding proper monographs. Interestingly, we were able to determine independent sets, maximal independent sets and vertex coverings in proper monographs even without knowing the physical appearances of these graphs. We did this by adapting some concepts from other known graphs to proper monographs. Hopefully, this study will contribute significantly to the search for complete characterization of autographs through their signatures. 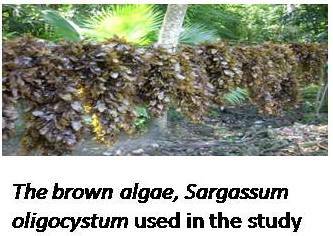 Biological Activity of Extracts of Sargassum oligocystum (Magnaye) against Aquaculture Pathogenic Bacteria. The Israeli Journal of Aquaculture – Bamidgeh, 63: 667, 5 pages, 2011. This research deals on the biological activity of different extracts of the brown algae, Sargassum oligocystum againstcommonly occurring pathogenic bacteria on fish and crustaceans. Research findings show that extracts of this algae show moderate to high antibacterial activity to tested pathogens, thus a promising sources of antibacterial agents for use in aquaculture. Integrated Biodiversity Valuation Framework: Ecological Approach. Journal of Wetlands Biodiversity, 3: 7-16, October 2013. There are so many approaches to value biodiversity and ecosystem services. However, they are all economic in nature and all based on economic goods and services only. None has dared value the ecological services that plants and the ecosystem have afforded for humanity. Considering biodiversity loss around the world and in line with The Convention of Biological Diversity (CBD) and Aichi Targets, there is a need to value the totality of the biodiversity including the intangible services humans cannot see. Most of the frameworks ignore the biophysical components of the environment as the backbone, put structure-processes-functions in different levels, and less integrated action at the end. In order to make a comprehensive framework for biodiversity valuation, this paper presents a conceptual framework in valuing biodiversity based on ecological principles. The following analysis, integrating socio-cultural, economic, and ecological insights, can help any decision maker to generate better information in sustainable conservation. This paper highlights the importance of biodiversity and its physical environment in driving and promoting processes and functions to provide life support system where humans are part of. Furthermore, all of those results in joint products and functions as life support system which is very important for any components (including humans) of the system. The fact that the ecological value as basis of any valuation is strongly supported by ecological insights. This life support system is frequently viewed and captures as goods and services from economic approach, as ethno practices/perceptions from socio-cultural approach, and as ecosystem sustainability from ecological approach. Integrating these three approaches would help a decision maker investigate comprehensive information correlated with biodiversity value for conservation purposes. Arthur L. Fajardo, Delfin C. Suministrado, Engelbert K. Peralta, Pepito M. Bato and Eduardo P. Paningbatan Jr.
Force and Puddling Characterization of the Tilling Wheel of Float-Assisted Tillers at Different Lug Angle and Shaft Speed. Soil and Tillage Research, 140: 118-125, July 2014. The tilling wheel of float-assisted tiller has smaller wheel diameter and lug angle than the cage wheel. The cage wheel-like configuration of the tilling wheel produces traction and floatation for the tiller. 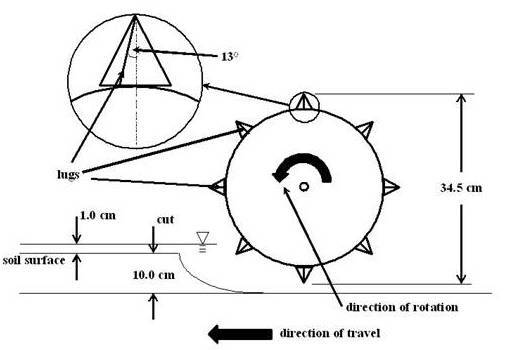 The high speed wheel rotation and spikes of the tilling wheel produce similar cutting effects as those of rotary tiller. The study determined the effect of varying lug angle and shaft speed on the puddling performance of the tilling wheel. The study was conducted using a single tilling wheel in a laboratory soil bin using Maahas clay. Generally, performance index and tractive efficiency was high at 200 rpm for all shaft speed and lug angle. Moreover, the tilling wheel with 13° lug angle was most preferred because of higher performance index and tractive efficiency. Secret Sharing Schemes Based on Graphical Codes. Cryptography and Communications, 6 (2): 137-155, June 2014. A secret sharing scheme is a method to distribute a secret among a set of participants in such a way that only certain subsets of participants can determine the secret. A construction of secret sharing schemes uses linear codes. In this work, we study the properties of secret sharing schemes obtained from linear codes based on graphs. Sorbents Derived from Lignocellulosic Waste Materials: Characterization and Potential Removal of Surfactants, Phenolic Compounds, and Nutrients from Environmental Aqueous Solutions. AES Bioflux, 6 (1): 91-100, April 2014. The pollution of aquatic ecosystems is a widespread problem among developing countries where industrialization, urbanization, and intensive agricultural and aquaculture activities have led to increased disposal of unregulated wastes. Adsorbents based on plant-derived materials have been widely studied to develop cost-efficient sorbent materials for the removal of different chemical pollutants. Banana peelings (BP) and rice husks (RH) are common agriculture by-products particularly in developing countries. As popular agricultural products, significant amounts of BP and RH are generated as solid wastes every day.This study investigated the potential of these common wastes as sorbents for ubiquitous water pollutants. Results show that the surface morphology of the of the two sorbent materials are very different and could be a factor in the differences in their sorption efficiency. In addition, surface functionality of the sorbents does not appear to differ, although BP showed slightly higher adsorption. Over-all, both sorbents showed potential for the removal of phenols and surfactants from contaminated environmental aqueous solution, and the removal of both phenols and surfactants appears to be affected by the salinity of the environmental water, but not of the initial pH conditions. Diversity and Colonization Pattern of Leaf-Litter Arthropods During Early Stages of Decomposition in Mt. Makiling, Los Baños, Laguna. Philippine Journal of Systematic Biology, 7: 39-52, 2013. Very few take notice of arthropod presence in leaf litter. This pioneering study aimed to look at the kinds and types of arthropods on decomposing leaf-litter for 10 weeks. Arthropods extracted from leaf litter samples were sorted and identified. A total of 1650 individuals were classified to belong to 13 orders, namely: Acarina, Araneida, Blattodea, Collembola Dermaptera, Hemiptera, Hymenoptera, lsopoda, Lepidoptera, Psocoptera, Trichoptera, Coleoptera and Diptera. The last two orders mentioned were the most family-rich. No distinct pattern of colonization was observed. However, initial andconsistent leaf litter arthropod colonizers were recognized. These were spiders, roaches, beetles, sprintails, flies, true bugs and trichopterans. Consistent colonizers were beetles, flies and true bugs. 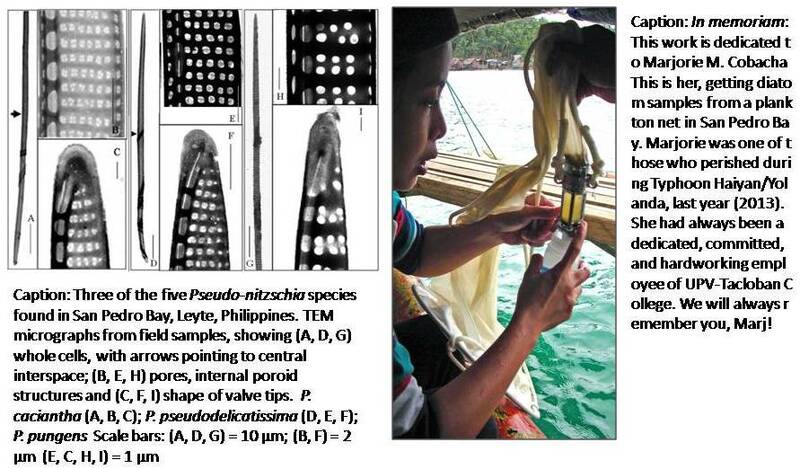 Species Account of Marine Diatoms of the Genus Pseudo-nitzschia in San Pedro Bay, Philippines. Philippine Journal of Science, 142 (1): 27-37, June 2013. Diatoms are microscopic organisms that inhabit the waters in oceans and freshwater regions. The name itself pertains to their elaborately designed shells that look like they are cut in exact halves. These glass-shells have unique designs that are used to distinguishone species of diatom from another, similar to how seashells are identified. Diatom communities have long been used to monitor water quality. These are also applied to postulate past environment conditions from extinct genera of diatoms. Today, there is a renewed interest on diatom study brought about by observations of ultra microscopic designs on their frustules visible only through electron microscopy. A popular diatom of interest is the needle-like diatoms of the genus Psuedo-nitzschia. Some species of this genus has been discovered to be the culprit of a queer illness that cause permanent loss of short term memory (amnesia, among other symptoms) aptly named Amnesic Shellfish Poisoning (ASP). Acid-washed valves of Pseudo-nitzschia from San Pedro Bay were observed and critically identified using transmission electron microscopy (TEM). Five species of Pseudo-nitzschia were revealed. Three of these namely, P. pseudodelicatissima, P. pungens and P. brasiliana are reported to produce the substance believed to cause ASP. Thankfully, we never encountered these in high densities during our sampling. But, the presence of potentially toxic species of Pseudo-nitzschia and the establishment of mariculture sites in San Pedro Bay point to a possibility of an ASP episode. Thus, it is prudent to monitor the abundance of this genus here. Anti-Ulcer Activity of Leguminosae Plants. Arquivos de Gastroenterologia, 51 (1): 1-5, January-March 2014. 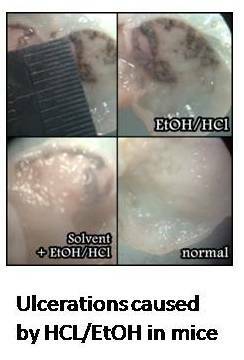 Ulcer is the most common gastrointestinal disturbance resulting from an inadequate gastric mucosal defense. Several drugs are available in the market to address the disease; however, these drugs are associated with unnecessary side effects. Previous researches have confirmed the efficacy of plant extracts for possible treatment of the disease. This research aims to evaluate the anti-ulcer properties of medicinal plants. 15-Lipoxygenase Inhibition of Commelina benghalensis, Tradescantia fluminensis, Tradescantia zebrina. Asian Pacific Journal of Tropical Biomedicine, 4 (3): 184–188, March 2014. Asthma is a chronic medical condition which affects millions of people across the globe. Asthma is characterized by the inflammation of the airway and bronchoconstriction with symptoms like wheezing, cough, dyspnea, chest tightness, and breathlessness. Previous researches have confirmed the efficacy of plant extracts for possible treatment of the disease. This research aims to evaluate the anti-inflammatory properties of medicinal plants with possible anti-asthma application. Rena Santizo, Augusto E. Serrano Jr. and Valeriano L. Corre Jr.
Proximate Composition and Dry Matter Digestibility of Ulva lactuca in the Black Tiger Shrimp Penaeus monodon. ABAH Bioflux, 6 (1): 75-83, April 2014. The nutritive value of the seaweed Ulva lactuca was analyzed for its crude fiber, crude fat, crude fiber, moisture and ashcontent together with carbohydrate content. This information will be used to predict its usefulness to be an ingredient for the formulated feeds of the black tiger shrimp which could replace the imported soybean meal and thus lessen the cost of production of this shrimp. Also, this study determined how much dry matter of the ingredient in the dried form as well as the concentrated form is digestible to the shrimp. The results showed that the raw form is 71.5% digestible while the concentrated form was 99.1%. This information is one of the good indicators of the quality of feed ingredients and can be used to select ingredients for shrimp feeds. The shrimp appeared to have the capacity to effectively digest Ulva lactuca in either raw dried powdered form or a powder protein concentrate as ingredients that might have very different nutritional qualities, which may reflect the natural preference and omnivorous generalist-type feeding behavior of this shrimp. The information obtained in this study will aid in the formulation of cost- effective diets for the black tiger shrimps. 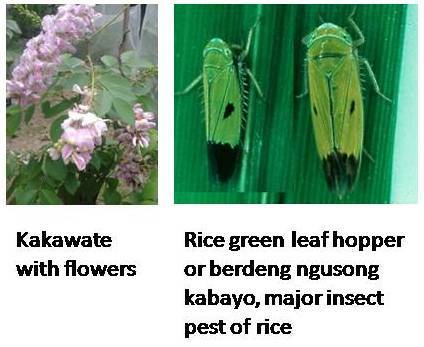 Behavioral and Olfactory Responses of Rice Green Leaf Hopper, Nephottetix virescens (Distant) to Volatile Cues from Tagbak (Alpinia elegans (C. Presl) K. Schum). Philippine Journal of Science, 142 (2): 167-173, December 2013. Determination of the Water Requirement and Kc Values of Sugarcane at Different Crop Growth Stages by Lysimetric Method. Sugar Tech, 16 (3): 286-294, September 2014. Knowing the amount of water needed by sugarcane during its growing stages is important in deciding the correct water application practices. This was determined for Phll 74/64 variety at the Sugarcane Research and Seed Farm, Pyin Mana, Mandalay Division, Myanmar in 2008. The total water used by sugarcane was 1,369.84 mm year r-1 which is lower than that reported in 1990 at 1,460.4 mm year-1. The crop coefficient values obtained were also higher than values at the initial and latedevelopment reported by FAO. However, Kc values obtained at development and mid-growth stages were in the same range reported by FAO. Rosy L. Janeo and Valeriano L. Corre Jr.
Bacterial Change in the Gut and Hepatopancreas of Tiger Shrimp Reared in Bioaugmented System. Journal of the World Aquaculture Society, 42 (6): 863–872, December 2011. The article reported and discussed the changes that took place in the gut and hepatopancreas of tiger shrimps in a bioaugmented system and fed with probiotics. The bacteria in the gut and hepatopancreas of shrimps in bioaugmented system and those fed probiotics were identified and compared with those in the control (without addition of any microbial product). These were further compared with the bacterial composition of the product added. The dominance of good quality bacteria (Bacillus sp) and the reduction of luminous bacteria (Vibrio sp.) in the gut and hepatopancreas were used as indicators of positive action of bioaugmentation. The study also reported the length of time for the bacteria to colonize the gut and hepatopancreas after adding microbial products in the water and in feeds. Results obtained in the study will give shrimp farmers the idea how bioaugmentation could change and improve the bacterial flora of shrimp before disease outbreak.